Is Eating Beans & Brown Rice Everyday Bad for You? 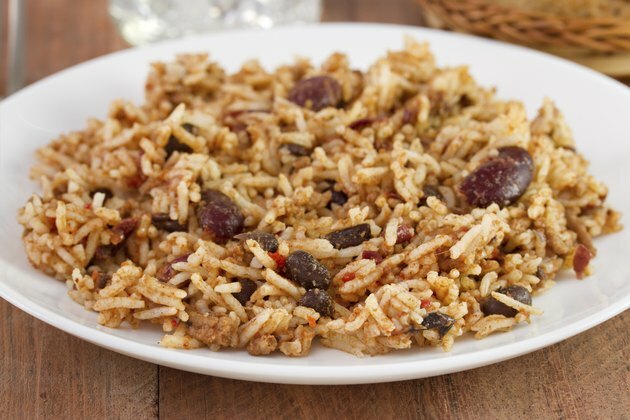 Beans with brown rice is a healthy, nutritious dish eaten around the world -- a staple in many Central American and Latin American countries, as well as in the Southeastern United States. The popular combination is a source of protein and provides part of your daily vegetable and grain requirement. However, eating only beans and brown rice can lead to nutritional deficiencies. Beans and rice, make a complete protein when eaten together, that is, one that contains all of the essential amino acids present in protein. While beans and rice, individually, are low in certain types of essential amino acids, each offers what the other lacks. The U.S. Department of Agriculture recommends that you consume 5 to 6 1/2 ounce equivalents of protein per day. A 1/4-cup serving of beans counts as 1 ounce equivalent of protein. Beans are all high in protein, although amounts vary. One cup of chickpeas has over 14.5 grams of protein, while kidney beans have over 15 grams of protein per cup. A cup of brown rice, which counts as 2 servings of whole grains, has 5.03 grams of protein. Brown rice, as a whole grain, and beans, regardless of type, are high in dietary fiber, which provides bulk to your diet. Both have a number of health benefits. Dietary fiber can help reduce constipation, as well as lower blood cholesterol levels. A cup of brown rice has 3.5 grams of fiber, while 1 cup of chickpeas has 12.5 grams per serving. One cup of kidney beans has 11.3 grams of dietary fiber. This amount of brown rice provides 9.2 to 14 percent of the recommended intake of fiber, while chickpeas and kidney beans provide 28 to 50 percent of the recommended intake. In addition to protein, beans and rice also help you reach your daily grain and vegetable intake. Beans are unique in this sense, as they count as a member of the protein group as well as the vegetable foods group. The U.S. Department of Agriculture recommends that you eat between 2 to 3 cups of vegetables per day and between 3 to 4 ounces of grains per day. The USDA recommends that at least half of your grain intake be whole grains, such as brown rice. While beans and rice is a healthy food choice, especially if you keep the added sodium and fat content low, eating only beans and rice will lead to other nutritional deficiencies. The USDA recommends that you eat a variety of proteins, including vegetarian sources of protein, such as beans, but also recommends that two of your weekly protein servings be seafood -- rich in essential fatty acids. Similarly, for vegetables, beans and peas make up only one subgroup of vegetables, and others, including leafy greens, starchy vegetables and red and orange vegetables, are needed in order to have a healthy, balanced diet. Joy of Cooking; Irma S. Rombauer et al. ChooseMyPlate.gov: How Many Vegetables Are Needed Daily or Weekly? ChooseMyPlate.gov: How Many Grain Foods Are Needed Daily? Do Beans Count As a Vegetable Serving? Are Pinto Beans a Complete Protein? What Grains, Seeds, Legumes and Nuts Are High in Protein? Do Beans Count as Carbs or Protein in a Diabetic Diet?